LOS ANGELES – Following a spectacular victory over top featherweight contender Robinson “Robin Hood” Castellanos in Mexico on Feb.15, “Gemelo” Alvarado is now the latest addition to the Golden Boy Promotionsroster, as the Los Angeles-based promoter is pleased to announce his signing to an exclusive contract. Born and raised in Managua, Nicaragua, Rene “Gemelo” Alvarado (20-2, 14 KOs) has been fighting professionally since 2008 and is a former Nicaraguan super bantamweight titleholder. Since moving up to the featherweight division in 2013, he has continued to shine, winning three straight bouts. 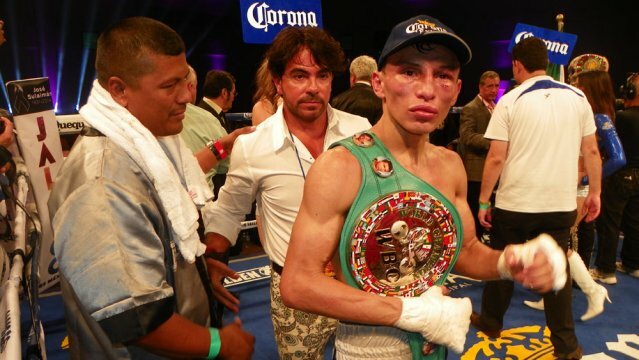 The most important was the aforementioned Feb. 15, 2014 bout, when he stopped Castellanos in the ninth round to win the WBC Silver Featherweight Championship. Now he has his sights set on a world championship, a goal he hopes to achieve in 2014. Rene Alvarado’s next match up will be announced shortly. For more information, visit www.goldenboypromotions.com, follow on Twitter atwww.twitter.com/GoldenBoyBoxing or become a fan on Facebook at Golden Boy Facebook Page and visit us on Instagram @GoldenBoyBoxing.